In 2008, Dr. Hawkins published the results of a two-year-long study on a trial hybrid gasoline-electrical EMS response vehicle in the Journal of EMS. This study exploded a number of myths about the supposed inability of hybrid vehicles to perform in an EMS operational environment. Hawk Ventures is at the drawing board again! We’re currently building a cutting-edge concept vehicle for Wilderness EMS operations. Our plan is to have a vehicle road-ready and equipped by the end of 2016. The Hawk Ventures WEMS Vehicle Team currently includes Seth Collings Hawkins, Jason Seidel and Jim Hawkins. 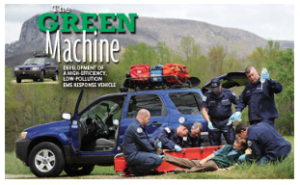 Standby for some truly cool and game-changing EMS vehicular concepts for remote medical care!